We're a few days into October, which means Halloween is just around the corner! I spent last weekend pulling out all of my Halloween decorations and sprucing up the house, which is just about my favorite thing to do ever. I absolutely love this time of year! The smell of pumpkin spice candles in the house, along with the delicious scents of everything I'm baking right now is just perfect. 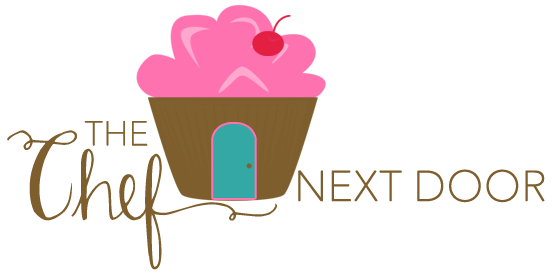 From different breads to cakes to cookies, I'm a serious bakeaholic! 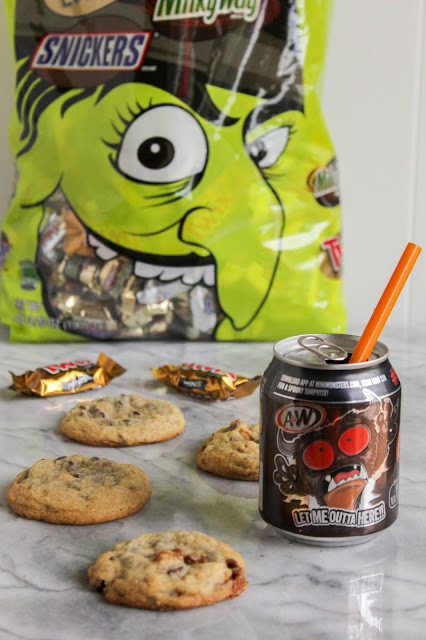 Speaking of baking and decorating and getting into the Halloween spirit, have you heard of a BOO kit before? It's so much fun, and so easy to put together! Simply grab a bag, basket, or bucket (like mine above), fill it with your favorite treats such as M&M's®, SNICKERS®, TWIX® and MILKY WAY® (just a few of my favorites! ), along with a homemade treat, and a delicious drink like A&W Root Beer. 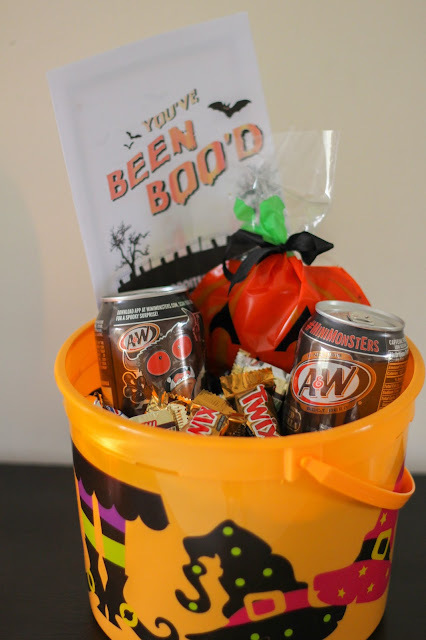 Print off this adorable You've Been BOO'd card from BOOItForward.com, sneak the goodie basket onto your neighbor or friends porch, ring the doorbell and run like crazy! They will then receive the instructions on how to #BOOItForward from you, and hopefully you'll start a BOO'ing revolution! It's easy to use the BOO card with these simple instructions! Since I wanted to include a special homemade treat in my BOO basket, I made a batch of delicious and extra chocolaty Chocolate Chip Twix Cookies. 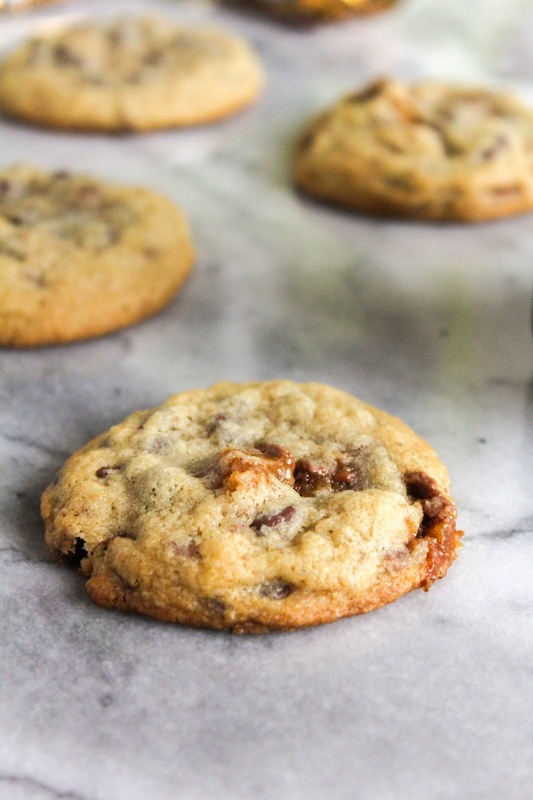 Filled with mini chocolate chips and chopped up Twix bars, there is a sweet crunchy surprise in every bite! Are you ready to put together your own BOO Kit? Start off by saving $2.00 on ONE (1) 6pk 8oz Cans or TWO (2) 2L and 2 bags of Mars® Candy with this coupon. Who's ready to bake up some cookies? I know I'm ready for another batch! In the bowl of a stand mixer, beat the butter and sugars until light and fluffy. Add the egg and vanilla and mix to combine. Add the flour, baking soda and salt to a bowl and whisk to combine. Slowly add it in batches to the mixer, scraping down the sides of the bowl as needed, until just combined. Fold in the Twix pieces and mini chocolate chips. 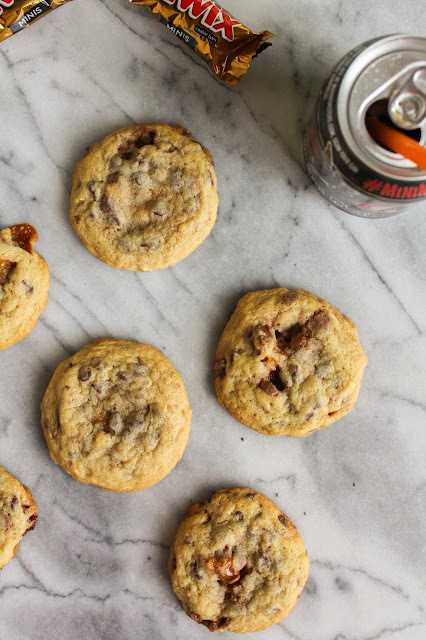 Using a medium cookie scoop, place nine mounds of dough onto each cookie sheet, spacing each at least an inch apart. Bake the cookies for 9 to 10 minutes, or until the edges have set. (Don't worry if the centers look soft, the cookies will firm up as they cool!) Allow the cookies to cool on the baking sheet for 5 minutes before transferring them to a cooling rack to finish cooling completely. Store the cookies in a cookie jar or airtight container at room temperature for up to 1 week. 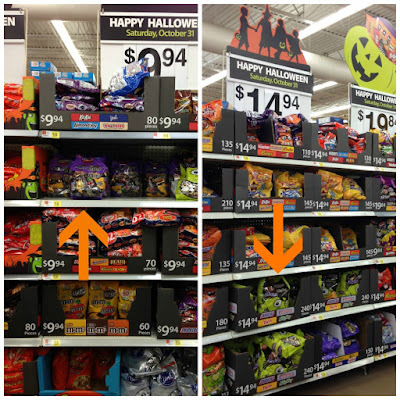 Find all of your favorite MARS Halloween candies at your local Walmart store in the Seasonal aisle! Don't forget to enter the giveaway below for your chance to win a $1,000 Walmart eGift Card!